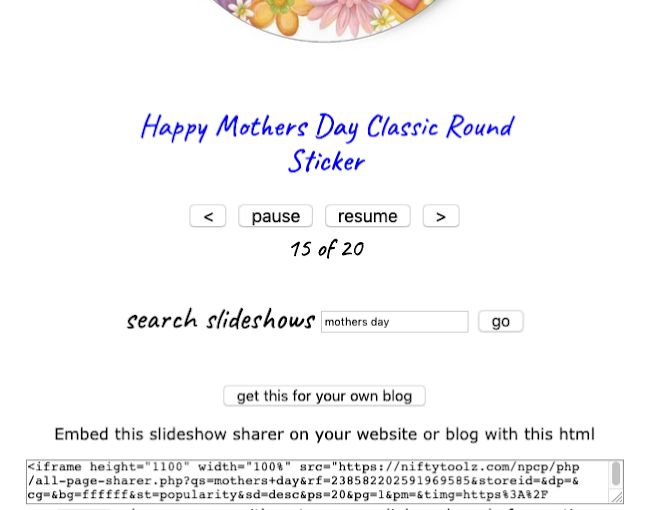 Here’s a slideshow of some Mother’s Day gifts and cards from Zazzle. It was made in Nifty and then embedded in an iframe here. Also works on Blogger and Weebly blogs (click for examples). See the end for the code used. Note that you need a self-hosted WordPress site. You can’t do this on the free wordpress.com ones because they don’t allow iframes, as used in this technique. Again, tap/click the button to see the code.